Get ready, CMIL’s annual Marine Science Day is here! 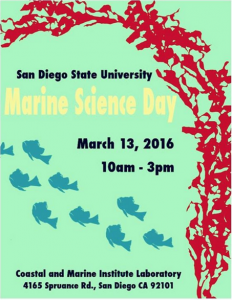 The 2016 Marine Science Day is a free event open to the public that will showcase current research at SDSU, the facilities at CMIL, and tons of educational activities related to marine ecology, conservation, and importantly the impacts of the current El Nino on San Diego’s marine ecosystems. This a once a year opportunity where CMIL has opened its doors and is a rare chance to experience what goes on at a working marine research laboratory. Check out the Marine Ecology and Biology Student Association’s Events page for more information. We hope to see you there!